In November 1861, a group of dissidents/Unionists burned several bridges in East Tennessee. 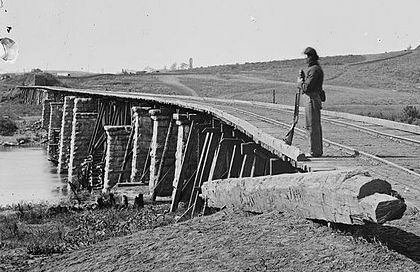 They had been told that Federal soldiers were on their way, and by destroying these bridges, the Federal soldiers could quickly capture key points. Unionists in East Tennessee then could mobilize and help hold the area, creating a stumbling block for the new Confederate nation. Of course, we know that it did not work out this way. 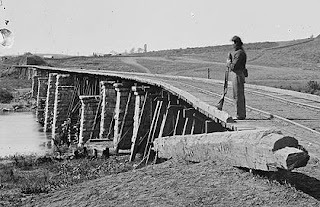 The bridges were burnt, but regular Federal army forces never materialized (for a variety of reasons). While looking for something else (how often does that happen? ), I came across a list entitled "List of Political prisoners made in obedience to call of the Confederate Congress" (Found in Louis Brown's book on Salisbury Prison). The list is dated February 17, 1863, and there are 131 names on this list. Among those 131 names are thirteen who are listed as "One of Fry's bridge burners in E. TN." They all have a date of March 22, 1862, which I assume is an incarceration date. The majority of the bridge burners that they caught were sent to Greeneville and then on to Alabama. A few were hanged. What are the stories behind these thirteen? Why were they taken to Salisbury? Were they captured in North Carolina? Questions like these just serve to remind me how little we know about some of the aspects of the time period. Those below are listed as being incarcerated at Salisbury Prison in February 1863, and listed as bridge burners. I assume the county behind the names is the county where they were from. I could list a bevy of questions: who were these men? Where were they captured? Were they tried in a civilian court someplace? What happened to them - did they survive the war? This week, I am writing about the Shelton Laurel Massacre. Traditionally, this story starts with the Unionist-leaning Shelton Laurel people being refused salt from the government for their personal use. This led a group to break into some type of government facility in Marshall and take salt. As with most stories, there is a whole lot more to this one, but that's another post. Arguably, salt was the most important commodity to rural people across the United States. While it had many uses, the most important would be to preserve hog meat for future use. It took 10 pounds of salt to preserve 100 pounds of pork. If you are feeding a large family, 100 pounds does not go far. Prior to the war, North Carolina salt came from the coastal area, and from Saltville, Virginia, and appears to be a private venture. Realizing the importance of salt, North Carolina took steps in late 1861 to ensure domestic supply. On December 6, the North Carolina Convention ratified "An Ordinance in Regards to the Supply of Salt." The state pledged at least $100,000 to the manufacture of salt on the along the coast. At the same time, the article stated that Dr. John Milton Worth, brother to future governor Jonathan Worth, was appointed North Carolina Salt Commissioner. An article in the Semi-Weekly Standard, December 18, 1861, made note of "private parties" making salt on Currituck Sound, Bouge Sound, Topsail Sound, in Carolina City, and soon, near Morehead City. It was the editor's suggestion that "farmers should not be hasty in killing pork this season." The state government set up salt works at in Currituck County but they were lost when Roanoke Island fell in February 1862. There were salt works at Morehead City as well. 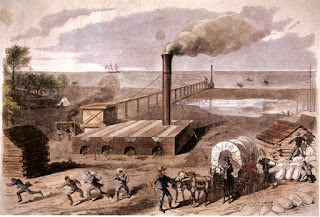 After the place fell to Union forces in March 1862, the government salt works were moved to Wilmington. In August 1863, the Wilmington Salt Works produced five thousand bushels of salt. The state also chartered the Chatham Salt Mining and Manufacturing Company in 1862. The plans for the Chatham County site were to drill a well. Also in 1862, Governor Clark sent Nicholas Woodfin and George W. Mordecia to Saltville, Virginia, with instructions to negotiate a contract to purchase cast iron pots and enough brine to produce 300,000 bushels of salt per year. At least in Buncombe, the county was divided into sub-districts, with a sub-agent responsible for the distribution of salt. They were supposed to sell the salt to citizens at cost. It must have been a thankless job. After the war, a citizen in Yancey County complained that they had four different salt agents over the duration of the war. There were numerous raids and assaults against North Carolina's salt-making industries during the war years. In October 1862, Federals destroyed the salt works at Bogue and Currituck Inlet. In February 1863, the salt works at Wale's Head, Currituck Beach, were destroyed. On Christmas Eve 1863, portions of the 158th New York Infantry and 9th Vermont Infantry, with sailors from the USS Daylight and Howquah, moved against salt works near Bear Inlet. On April 21, 1864, Federal forces raided the salt works at Masonboro Inlet, near Wilmington. 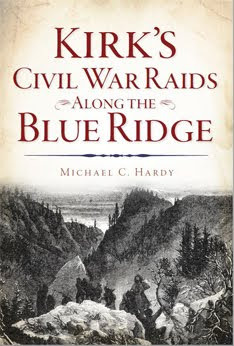 Probably better known are the raids taking place against Saltville, Virginia, one taking place in October 1864, and another that same December. The raid on Marshall in January 1863 was supposedly because local residents, who were not pro-Confederate were not getting salt. I wonder, was this Confederate policy, state policy, or simply the policy of the local salt agent in charge of Madison County? Time to start putting that 2017 calendar together. 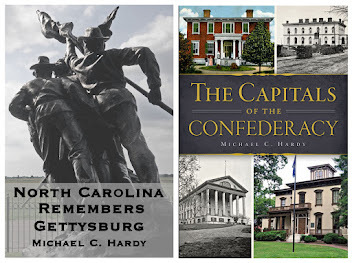 I am still out stumping the Capitals of the Confederacy/North Carolina as the Last Confederate Capital until late in the year, when the Branch-Lane book will be released. 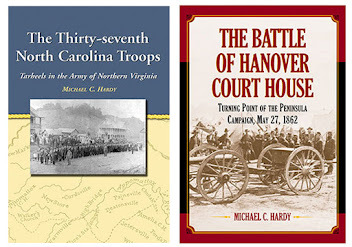 If you are interested in having me coming to speak to your Round Table, SCV Camp, historical society, library, etc., on any of my books, please drop me a line. February 11-12, Malcom Blue Farm and Battle of Monroe's Crossroads (Weather permitting). Last night was the premiere of the Petersburg episode on Blood and Fury. So how did I become involved? Here's my story. In May of 2016, I received an email from Randy Chase, a researcher/associate producer with Cream Productions, regarding this new series. Their final episode was going to be, in part, telling the story of the 37th North Carolina Troops and the Petersburg breakthrough on April 2, 1865, and they wanted to know if we could chat. I'm not sure how they got my name. Maybe it was a simple search online, but I'm always happy to talk history, and I do know one or two things about the 37th Regiment. After a couple of phone calls, I was scheduled to meet the crew in Nashville, or Fredericksburg, or maybe even Washington, D.C. After a few more phone calls and email messages, the crew decided that I was close enough for them to shoot locally while they traveled between Nashville and Fredericksburg. But I had to find a place. The Avery Museum really doesn't have the space needed for the cameras, so I shot a note to a friend about using one of the rooms at Lees-McRae College. We wound up using the Alumni House at Lees-McRae (thanks Michelle Scott!). This all transpired in a frenzied 48-hour period. First, I was on my way to Fredericksburg, then they were coming here, and I had to secure a site: a wee-bit nerve-racking, as you might imagine. They arrived in Banner Elk before I did, and I discovered that they had moved every bit of furniture in the room we were using. That made me a wee-bit nervous as well. We were the guest of my friend and the college. They had promised to put everything back. It took about an hour for them to finish setting everything up, and in that time, we conversed freely. When it came time for the interview, I was in front of the bright lights for at least three hours while they fired off question after question. I guess, after spending twenty years studying the 37th Regiment and the Branch-Lane brigade, I was as ready as a person could be. Needless to say, I had to come home and take a nap after that grilling. And yes, they got everything put back in the room, and Michelle was delighted with how it looked! It always makes me nervous when I am interviewed for something. This was not my first "rodeo," of course. I've been on TV before, on the radio, and interviewed several times. But still, when the final product is released, I'm always wondering what they used, how did I come across, (did I really say that? ), and hoping I didn't look odd (dang my beard is getting gray!). My take on the episode? Yes, they could have used a better wardrobe department, and yes, they needed some skilled interpreters/reenactors. Why was Nicholson in a cavalry uniform? To be honest, I would have preferred the story of Lt. Octavius Wiggins to Capt. William T. Nicholson’s. As the Federals came over the works, Wiggins was shot in the face, blinded, knocked unconscious by the concussion, and captured. He survived, and his fellow prisoners of war picked the grains of black powder out of his face. On the train ride to Johnson's Island, Wiggins jumped from the train, surviving the fall. He concealed his identity and worked his way south, only to arrive in Richmond and learn that the war was over. I think that was a better story. Overall, I think the Petersburg episode was one of the better ones. The overarching mission of the series was to tell some lesser-known stories of the war. I guess that is kind of like my own mission, to research and write the lesser known stories. The role of the 37th North Carolina Troops is just as important as that of any other Tar Heel Regiment (and Confederate, when it comes to it). I'm just glad that I got to tell that story. You've probably figured out that I like lists of books. 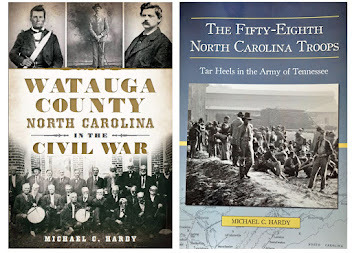 For several years, I've kept a list of North Carolina counties and their published histories of the War. Well, below is a new list, a list of North Carolina-born general officers of the Confederacy (with one exception). There are several names not on this list, like James H. Lane or William Henry Chase Whiting. They were associated with North Carolina, but came from other states. There are also a couple who are buried in the Tar Heel state but who are not on this list, like William R. Boggs. He came after the war. The only exception that I have made is for Collett Leventhorpe. He was born in England, but when he moved to North Carolina (prior to the war), he never really lived any other place, and is buried in Caldwell County. I have also not included state-appointed generals, like John W. McElroy. These men are only Confederate-appointed generals. Of the 46 men on this list, 26 have no material published on them, save brief pieces in Warner's Generals in Gray, Powell's Dictionary of North Carolina Biography, or Davis's The Confederate General (6 volumes). Of the 18 who do have biographies, three of those are just sketches, usually presented at a monument dedication or a memorial service. For me, that leaves 16 who have bios. Of that number, six have multiple biographies. Braxton Bragg has eight, William Dorsey Pender, Leonidas Polk, and Stephen Dodson Ramseur have four each, and James Johnston Pettigrew has three. Bryan Grimes had two, and the rest, one each. As always, this is a work in progress. If I missed someone, or some book, please let me know. At some point, I will probably update this list to include theses and dissertations, and then maybe articles. This weekend, our friends at Ft. Fisher are holding their anniversary events. If you live in the area, please drop in and check out the living histories and special speakers. Two years ago, I was there, with thousands of others, including Ed Bearss and Governor McCory. It was a great event and I really enjoyed being a part of it. Above is the video of my presentation on the 150th anniversary weekend. I'm really looking forward to seeing my spot on Blood and Fury this upcoming Wednesday. At least I will not be in a big thick coat with gloves - kind of cold at Fort Fisher two years ago. Why do people think Zeb Vance was in the Klan? 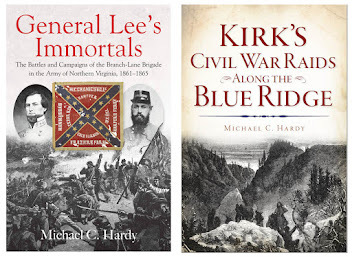 A couple of months ago, I was reading a new biography on a North Carolina Confederate general. 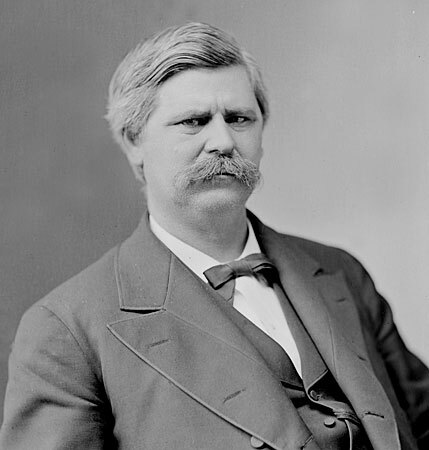 In this book, the author claimed that North Carolina Governor Zebulon Baird Vance was a member of the Klan, eventually elected to "Grand Dragon" of the Realm of North Carolina. That kind of took me aback, and led me to dig a little further. Most of the entries I found are like this one from Invisible Empire: The Story of the Ku Klux Klan, 1866-1871, by Stanley Fitzgerald Horn in 1969: "Ex-Governor Zebulon Baird Vance was generally supposed to be the Grand Dragon of the Realm; and the testimony of the confessed Ku Klux was to the effect that within the Klan Vance was generally looked upon as the chief of state." (194) Horn, however, gives us no source for his vague notion regarding Vance's involvement. It is quite possible that Horn got his idea about Vance's involvement from a 1924 book by Susan Lawrence Davis. She writes in Authentic History Ku Klux Klan, 1865-1877 that "The Ku Klux Klan, led by Zebulon B. Vance, Grand Dragon of the Realm of North Carolina, succeeded in driving from their soil the 'carpet-bagger' and all other kinds of invaders, and impeached W. W. Holden from the office of Governor." (236) Once again, no documentation. But the words "Realm of North Carolina" appear in all three works. I dug a little further, but I found no reference to Vance and the Klan prior to 1926. I did finds lots of references to Vance being in the Klan referencing Davis or Horn. Maybe this all stems from a letter that appears in the Testimony Taken by the Joint Select Committee to Inquire into the Condition of Affairs in the Late Insurrectionary States, Volume 2 (1872). Thomas A. Hope, from Lincoln County in an affidavit, stated that he had "frequently heard it talked among the members that Z. B. Vance was the chief of the State; do not know this of my own knowledge, have only heard it talked of." (400) This was the only mention of Vance I could find. Vance was not called to testify. So what do the Vance biographers say about the matter? Dowd, published in 1897, is silent on the matter. Weinstein's Zebulon B. Vance and The Scattered Nation makes no mention. Cooper's Zeb Vance: Leader in War and Peace makes no mention. I checked several other sources, and looked for references to Vance in various US Congressional documents related to the Klan, but I could never find Vance's name. It is interesting to note that Milton Ready, a retired UNC-Asheville history professor, came to the conclusion in an article in 2015 in MountainXpress, that Vance "loathed the Reconstruction-era Ku Klux Klan, condemning its members as cowards and 'ruffians,' its intimidating methods as unlawful." Maybe, just maybe, it is time to stop putting Vance in the Klan since he was probably never involved with it in the first place. In the January issue of America's Civil War, there is an interesting piece on the LeMat revolvers, written by Michael G. Williams. The LeMats are fairly rare nine-shot .42 caliber revolvers that also had a small 20-guage shotgun barrel underneath. Imported during the war, they were owned by the likes of J.E.B. Stuart, Braxton Bragg, Richard H. Anderson, and P. G. T. Beauguard (Serial #8). The article has a sidebar about Stonewall Jackson's LeMat. But as the sidebar states, we don't actually have any proof that Jackson owned a LeMat. Maybe J.E.B. Stuart gave him one, about the same time that he presented him with a new coat, right before Chancellorsville. The article includes a picture from the collection of the Virginia Military Institute. The photo is of a sitting room or parlor at the home of Mary Anna Morrison Jackson, taken in Charlotte, North Carolina. Mary Anna was from the area and lived in Charlotte twice after the war (she died there on March 24, 1915). In post-war newspaper accounts, she is frequently mentioned exhibiting some of Stonewall's personal effects. A visitor coming to the annual bazaar held each January to raise money for indigent Confederate soldiers could see Jackson's sword and other mementos. 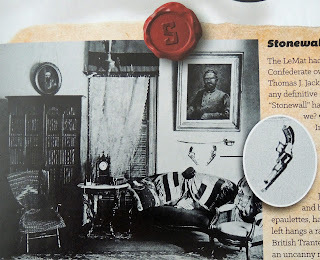 When the national reunion of the United Confederate Veterans was held in Charlotte in 1929, visitors could stop by the home of Jackson's granddaughter and see these same relics. Pictured in the image are a clock, field classes, epaulettes, sword, and two pistols. One pistol is identified as a British Tranter. The other bears striking resemblance to a LeMat, with its shotgun barrel under the main barrel, ornate trigger guard, lanyard, and "subtle slope atop the gun's frame..." Williams poses the question: "If Jackson owned a LeMat, where is it?" Jackson's cased Beaumont-Adams revolver, his Lefaucheaux pin-fired revolver, field glasses, and Model 1850 US Field and Staff sword are all held at the former Museum of the Confederacy in Richmond. But where is Jackson's LeMat? As a side note, Williams describes the sitting room as being in Jackson's former home in Charlotte; however, Jackson never actually lived in the home where Mary Anna resided after his death. For the past few days, I've been reading Denis Peterson's Confederate Cabinet Departments and Secretaries (2016). Peterson does a good job detailing the various cabinet officers’ positions, and covering the men who filled those offices. There were several of these men about whom I really did not know much. However, I have now twice come across sections that I feel are wrong. 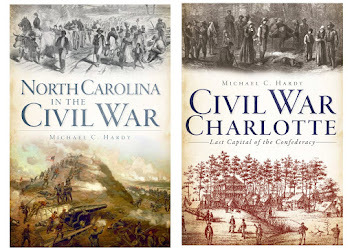 The first was dealing with the last days of the Confederate government in Charlotte. I will not go into the details, since I have written two books on the subject. 2): Peterson writes that North Carolina could not send troops because they were concerned with Forts Hatteras and Clark. Construction of these facilities does not begin until North Carolina leaves the Union on May 20, 1861. But, North Carolina is sending troops. 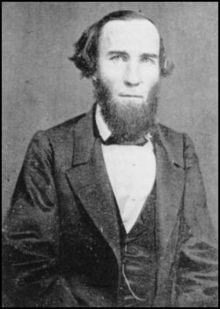 On May 17, 1861 (three days before secession), Governor Clark telegraphs Walker, requesting him to accept four regiments of 12-month men. Walker sends word back to Clark, directing that the regiments be sent to Richmond. 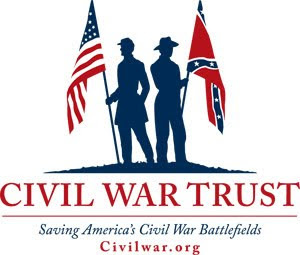 The 1st North Carolina Volunteers transfers to Virginia between May 16 and May 21. 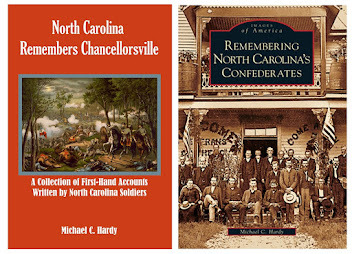 The 2nd North Carolina Volunteers leaves for Richmond on May 22, 1861, the 3rd North Carolina Volunteers leaves for Suffolk, Virginia, on May 29, and the 4th North Carolina Volunteers leaves for Suffolk on June 11. This is all about the same time that the construction of Forts Hatters and Clark begins. While North Carolina would want some of these troops back to defend their state in late 1861 and early 1862 (battle of New Bern), I would argue that the Tar Heel state does not have a problem sending troops to join the regular Confederate army. I'm not one-hundred percent sure, but I think Peterson is relying upon some older, secondary sources. For the Charlotte problems, he cites Patrick's Jefferson Davis and His General, published in 1944. For the above citation, it is Harris's bio on Walker, published in 1962. No printed text is perfect, or, as I often say, I am only as good as the material that I find. However, it makes me wonder what I am not catching, because I am not as well read in the lives of people like Walker, or Reagan, or Benjamin.